A demagogue is a political leader who seeks support by appealing to popular desires and prejudices rather than by using rational argument. When you know what a demagogue is, you are more conscious of their methods and alert to them. And you won’t be suckered, because being suckered makes you feel like a fool. 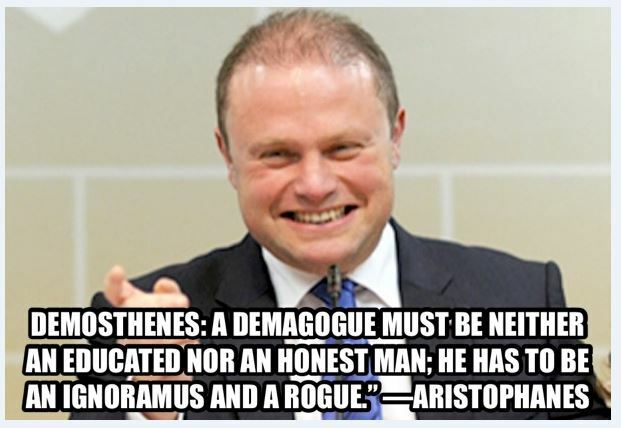 So many people fell for Muscat simply because education in Malta is so poor, and vocabulary so limited, that they don’t know what a demagogue is. A couple of exceptions can be made, of course, in those who know exactly what a demagogue is but who are or were too eaten up by personal malice, resentment or hunger for material goods to bother about being suckered. They were happy to be suckered if it got them what they wanted. And that is why you had the sorry situation of educated people voting for a common demagogue. And what does your perfectly true portraiture of the general education of the general public in Malta say about the country’s education system of the last 25 years? Is there a blame to shoulder some-where? Something went wrong for sure. And, is such a situation replicated somewhere else in Western Europe, apart Malta? I’m sure that not only the word ‘demagogue’ would cause problems to be understood by many people, I think adding ‘quintessentially’ to it continues to complicate the understanding of the phrase even more. Yes, I know. Ghaffigta jien din id-darba. He is realising that not all is well in the kingdom. When you are faced with a choice of being optimistic or not it means that there is a problem. In fact the problem is Labour itself. A father and a listener? Wasn’t that John Dalli’s second profession? 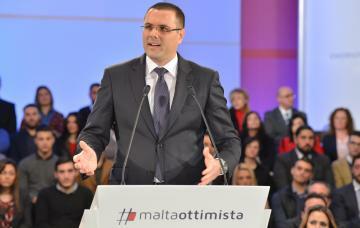 “Speaking in glowing terms about Joseph Muscat, Dr Castaldi Paris said it was good to have a Prime Minister who was able to take of the mantle of Prime Minister and become “a father and a listener”. While most have realised, in the months since March 2013, what a cheat, charlatan and impostor Joseph Muscat is, Ian Castaldi Paris praises the PM for being able to take of the mantle of Prime Minister and become “a father and a listener”. Some people are so spineless and have no shame. No spine, but lots of guts. Excellent piece . Can I safely assume he will continue in power even after the next general election?